MIAMI GARDENS, Fla. — Broward, Palm Beach and Miami-Dade counties are home to some of the best high school football programs in the nation. In 2016, a team from one of these three counties won the state championship in five out of the eight FHSAA classifications, while two others qualified for their title game. In three weeks, the pursuit of a state title will begin once again with teams from these counties frontrunners to repeat last year’s success. 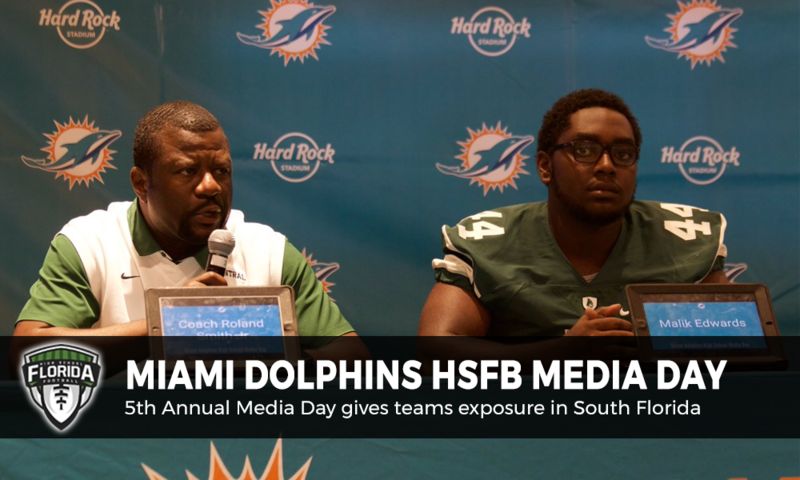 Over 100 teams traveled to Hard Rock Stadium in Hialeah Gardens for the Miami Dolphins High School Media Day, where players and coaches discussed their off season workouts and changes as well as plans for the upcoming season. After last year’s season opener, Archbishop McCarthy rattled off ten straight victories en route to a second consecutive Gold Coast Conference title. However, in 2017 the Mavericks will be joining Class 6A District 15 with the likes of Boyd Anderson, Dillard, and Boynton Beach. Despite the departure of QB Quinn Dempsey and CB/WR Logan Giordano to Chaminade-Madonna, Broward county’s leading rusher, Jacob Baptiste will be back for his junior year. Head coach Byron Walker is also confident in his team’s ability to play in district, rather than independent, but noted the inexperienced offensive line as a weakness. Baptiste’s success, and ultimately Archbishop McCarthy’s, will be dependent on that offensive line in the new season. Cardinal Gibbons’ nine wins a year ago was the most for the school in the past decade, but ultimately, the Chiefs fell short of their goal of a state title. Returning QB Nik Scalzo, wide receiver core of Carlos Sandy and twins Lavontae and Tavontae Decius, DE Khris Bogle and S Maxwell Worship will be key to building upon last season’s success. As will DB Marquise Williams, a transfer from Coconut Creek. Defending 5A State Champions American Heritage stands in the way of the Chiefs’ title hopes, having defeated Cardinal Gibbons twice last season, once for the district title and later in the regional semifinals. The Miami Northwestern Bulls went from a .500 team to legitimate title contenders in 2016, winning perhaps the best district in all of South Florida with Carol City and Miami Central. Head coach Max Edwards believes his array of seniors will build upon last season’s success with an even deeper run in the playoffs. With a four-week stretch of road games against Booker T. Washington, IMG Academy and Miami Central and a home game versus Carol City, Northwestern will be tested early and often as they look to return to the playoffs in the cutthroat 6A-District 16. Despite a 4-7 campaign in 2016, the Cooper City Cowboys made an appearance in the 8A playoffs. The star of that team, RB Tyler Brown, graduated in the spring but QB Mike Diliello will return for his senior season, looking to take the Cowboys back the playoffs. With a talented team such as McArthur in the district, which went undefeated in the regular season, and a road game against Oxbridge Academy, the Cowboys will certainly be tested in 2016. Coach Walker believes they are prepared for the challenge. The Wildcats weren’t projected to make the playoffs last year. But thanks to some late game heroics from Keshaun Clarke against Miramar, Western made it to the postseason. Their seven wins last year were the most since 2012 for the program and they are looking to build upon that win total. Returning Clarke, the starting RB, and QB Harrison Story, there is no reason to count Western out in a district that features the Flanagan Falcons. The Rockets are a staple, not just in the postseason, but in the state championship, having rattled off four straight titles prior to missing the playoffs in 2016. The fact that Miami Central is nationally ranked heading into the season even after missing the postseason speaks to how difficult this district is. Playing Carol City and Miami Northwestern wasn’t enough for Miami Central. The Rockets will play nationally ranked programs on the road in Bishop Gorman and IMG Academy. “We play week in and week out really competitive so those games are going to be cake walks,” ILB and Louisville commit Robert Hicks said. "We play week in and week out so those games are going to be cakewalks"
Hicks is joined on defense by several transfers in addition to last year’s strong core. James Cook, brother of Dalvin Cook, will lead the Rockets’ offense in his senior year. Miami Central is hungry for the postseason and it will be difficult to stop them as they look to regain their position atop Class 6A. The Raiders did not miss a beat this offseason. St. Thomas Aquinas lost starters on both sides of the ball, namely QB Jake Allen and WRs Trevon Grimes and Mike Harley, but regardless of lineup shake-ups, the Raiders are still ranked in the top five in the nation prior to the season. “We want to make sure that we take full advantage of the time with these young men,” head coach Roger Harriot said. Cornerbacks Asante Samuel, a Florida State commit, and Al Blades Jr., a Miami commit, lead a talented defense rounded out by DE Nik Bonito and Rocky Shelton. As usual, the Raiders will play some of the top teams in the nation, hosting St, John Bosco (Calif.) and traveling to Arizona to play Centennial. St. Thomas Aquinas will look to extend their 7A championship streak to four straight years this coming fall. After coming up short in the state semifinals a year ago, the Tornadoes are geared up to return to the postseason yet again, making another run at a title. Booker T. Washington ranked #11 in the nation by USA TODAY, will play two state champions in American Heritage (Plantation) and Miami Southridge. Additionally, the Tornadoes will face Miami Central, Miami Northwestern, Chaminade-Madonna, Carol City, Columbus and Coral Gables some of the top teams in not just Dade, but the country. Quarterback Daniel Richardson returns to lead the offense as a junior after a stellar sophomore campaign and retains many of his targets in the passing game, including senior Tyquan Thornton. In a new district for 2017, the Tornadoes will look to maintain their reputation as one of the best programs in the state. Transitioning from Independent to 4A will be a huge change for the North Broward Eagles, but returning the QB/WR tandem of Logan Shooster and Kevin Austin will assist in the transition. Austin is one of the most talented offensive players in south Florida, but many have questioned the talent he has faced in recent years. The four-star wide out will rise to the challenge in 2017 against bigger schools. @NBPFootball WR Kevin Austin (@Ka_szn) on his team's transition from Independent to 4A. Despite the new district, North Broward will face similar foes in Key West and Calvary Christian as they look to make the jump to a top tier program in 2017.